Fight for the spirit of christmas! Thanks for playing it! Just a quick weekend exercise, but I really like doing these super short games every now and then to try and come up with new ideas and test different techniques - and also to take a break from more long term projects. Survive the Game Jam 6 community · Posted in STGJ 6 is Over! Another idea could be a Discord server which might help in building a community around the jam. I'm in UTC+1 so the jam runs from Thursday at noon to Sunday here, but it might not work that well for people in the Americas. Public voting on entries might generate more interest and make it more visible in the general jam community. Survive the Game Jam 6 community · Posted in 24 hours left!!! 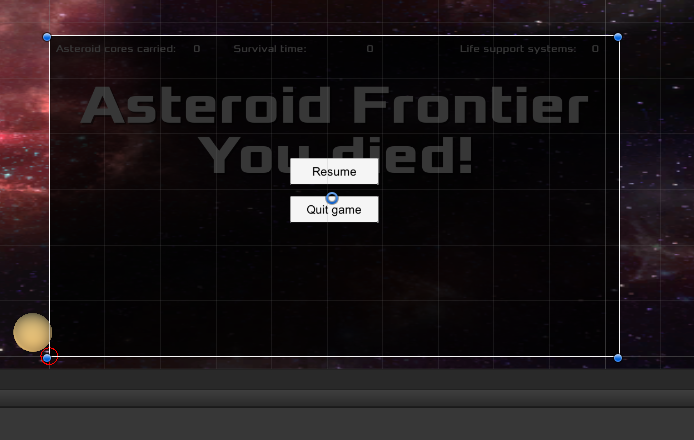 Coming up to the T minus 14 mark, I mostly just need to get some UI stuff in place - after some sleep. Reasonably smooth sailing here, even if my head hurts a bit from an overdose of 3D math. First playable (in the loosest sense of the word) running now. This one is going to need all the gameplay tuning I can squeeze in! Survive the Game Jam 5 community · Posted in DONE!!! Wish I could say the same. It's midnight here, so planning to finish scene layout, then get a bit of sleep while my crappy old laptop does light baking, and then I'll hopefully have time for a bit of gameplay tweaking in the morning. Think it's going ok. Got my concept together and a very basic version running. Now I just need to remember to actually playtest and iterate instead of applying premature visual polish! Great to see this jam back in action. Hope to get an entry in, but working on my tired old laptop with a defective graphics card since my proper development workstation currently reboots at random intervals probably due to a failing power supply unit. Fans going like crazy running just Blender and Unity (feels like a jet engine sitting on my desk) but I'll give it my best shot! More fun that way. Also, it really helps to find bottlenecks in your game creation process. Optical Optimize #2 community · Posted in Time frame extension? Optical Optimize #2 community · Created a new topic Time frame extension? I have the perfect project for this - and will give it my best shot whatever is decided - but would it be possible to extend the time frame so it includes two full weekends? Early Friday morning is not the ideal time of the week for a final mad dash to the finish line for those of us trying to do this in parallel with a 9-5 job in a European time zone. Best aspect remains John's fantastic voice acting + general audio work! Link seems to have expired. If this was my game jam, I'd delete those four entries submitted today that have absolutely no relation to the theme, and also ban that user. I'm a game development generalist with a strong coding background interested in collaborating with a pixel artist on this jam. Planning to test out some new tech ideas. Haven't got any specific game design or story decided yet, but it's definitely going to be pixel-based. Survive the Game Jam 4 community · Created a new topic Keep this running! Can't take part this time (or the next) as I'm currently busy on another jam project, but I really like the format of this! Post-Apocalyptic Jam 2017 community · Replied to Shaggy Fires in what's your feeling about this game jam? Post-Apocalyptic Jam 2017 community · Posted in what's your feeling about this game jam? Just started the channel "Social" on the server - let's keep it, well "Social" there, and if that's not your thing, I've also created the "Thermonuclear Warrior" channel. What's up with you people??? Some of you don't want to sit through your entire four weeks? First entry just up??? Anyway, as it was brought to my attention over on our Discord type of alternative form of communication and survival, some people might actually want to share what they're doing along the way, so check out devlogs for early entries! And peace - stay fun, but give peace! Yeah, will definitely try to do something to cover the entries at the end of the jam. Post-Apocalyptic Jam 2017 community · Posted in First rule (about story telling). Sorry about the late reply - it's okay, just not too much game design, but since we're almost ready to start, it's probably a moot point now! Post-Apocalyptic Jam 2017 community · Posted in 1st rule question. 1st rule includes anything created specifically for the jam - so if you have e.g. a general character controller or a collection of UI components you've created for a different project, that's absolutely fine - just don't start working on anything game-specific before the jam. It really depends on what you're creating, but quality generally tends to beat quantity. No need to share source code - this is a trust-based jam! Post-Apocalyptic Jam 2017 community · Posted in Question about 1st rule!